New Book changing the way people view the past, present, and prepare for the future. Every culture goes through predictable cycles of abundance and catastrophic “resets.” Eric Wilson, the director of the 9/12 Project and former leader in the Tea Party movement has released his latest book “Cultural Cycles” and warns the United States is on the brink of its next reset, with potentially disastrous results – and he backs it up with data. Owensboro, KY – "Cultural Cycles" is a book written by Eric Wilson who is also a professional business forecaster for an international company and worked in the field of analytics for over twenty years. 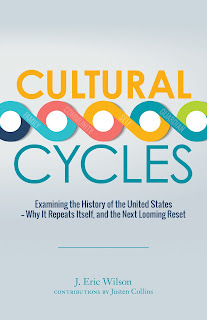 Through an intriguing mixture of historical acumen and big-data analytics - Cultural Cycles examines the cyclical nature of history and applies it to the United States today. Basing his observations on repeating eras and cycles from the seventeenth century to the present, Wilson reveals that the United States’ next cultural reset is imminent and posits what the consequences will be for a nation already divided. Eric’s book is a fascinating, easily understood exploration of history and the future, Cultural Cycles uses practical reasoning and intuitive insight to reveal what many sense—the next great turn of the wheel of history. His book demonstrates a predictable cycle of historic extremes from periods of abundance and growth to cultural crises, or “resets,” marked by disastrous social and political upheaval. Each cycle, per his calculations, is approximately eighty-two years and separated into four distinct eras called “Family”, “Community”, “Self”, and “Guardian.” At its worst, during the final era comes a reset that can destroy a culture—and any nations strong enough to survive such events are forever changed. For over twenty-five years now – in my “day” job of analytics and business forecasting – I use past results and forecast outlooks to predict future actions and events every day. I have thrived in the corporate world by observing patterns and correlations in events and attempting to explain – not necessarily “why” something occurred – but “what” might occur next. Most times – whether people realize it or not – I am far from alone in these pursuits. While they may not get paid to do so, most people generally try to anticipate what is going to happen in their lives. Of course, the majority do not fully understand the statistical probabilities or potential forecast elements involved. Regardless, they still spend their time guessing what might happen tomorrow or prognosticating to their peers about the future – even if it is just which team will win this Sunday’s game. We all make these guesses, but what if we could see into the future? Would you not want to “peer under the shroud” and see what was to come? I am not talking about learning the next winner of the Super Bowl or Lord Stanley’s Cup, but more like knowing what type of culture shifts we will see in the coming years. This is actually not much different than forecasting the sales of widgets that a company is going to hit next quarter. To do this, I would look at historical results for recent months and years – as well as other market indicators and demand drivers – and then (through the magic of some pixie dust…and mostly statistics) I would develop a picture of what the future of sales will look like. The key is to look at enough relevant data and enough history to begin to see patterns. Patterns such as summer sales increase by 22% each year due to seasonality or a summer selling season. Or – if you have a product with a life cycle of forty months – we begin to see sales decrease at an increasing rate after that time has passed. Maybe we see indicators that tell us that an increase in home sales correlates in ninety days to a corresponding increase in sales of our product. Do these same patterns exist in the world at large? Can we glean them to see more than sales but also the impending changes in cultural moods and attitudes or even forecast the probability of major world events? If so, the key would still be to look at enough relevant data and enough history to begin to see patterns. This is what I decided to do – in my spare time away from that day job. I started looking objectively at history and gathering as much data as I could find. Over the years, I have come to realize a few things about myself. One, I am obviously not normal. Two, I really should find a better way to enjoy my time away from work. But lastly, I have also realized that I have a disposition that takes joy in finding the relationships in seemingly unrelated things and an acute ability to sort through the ambiguity and messiness of those things down to their root cause and effect. In addition to this, the future and the past fascinate me, and I am the kind of person who grasps the connectivity of seemingly unconnected events and loves to peer over the horizons. This has suited me well, and I have parlayed it into over two decades of “on-the-job training” through a fulfilling career in analytics, big data, and business forecasting. My passion for connections and predictions permeates my personal life as well. This book has become the intersection of my professional and personal background and skills with my worldview and love of history. It might sound overly complicated at first, but let us try a quick little experiment together to demonstrate how simple some of these concepts can truly be. Chapter 2 - Are You Smarter Than a Forecaster? Even though what I do – and forecasting in general – may seem implausible at worst and unreliable at best to many, it is also intuitive to most. Look at the chart below (figure 1) and guess where the next point will fall. Congratulations! You are now a forecaster. Barely 700 words from where this book began, you have arrived at the same place it took me three decades – studying statistics, obtaining certifications, continuing education, and carrying on a career practicing analytics and forecasting – to reach. What this shows is that predicting the future is not crazy but rooted in some science. As much of it is math or algorithms, there is an equal part that is the art of prediction and logic that we use. The core of predictive analytics relies on capturing relationships between explanatory variables and the predicted variables from past occurrences, and exploiting them to predict the unknown periods or outcomes. Often the unknown event of interest is in the future, but analytics can be applied to any type of unknown - whether it is in the past, present or future. For example, identifying suspects after a crime has been committed or credit card fraud as it occurs. So, why are we discussing Target or how to predict sales of widgets for company XYZ? I am hoping to convey that society already uses predictive analytics – as well as intuition – to help determine events and occurrences. Many companies are using data and observations to help see patterns and drive behaviors. We are not just suddenly waking up in a world with pattern dependencies, but they have always been around us – waiting to be discovered and tapped. It is not a leap of faith to look for these same patterns in life and society to help better understand where we have come from but – equally as important – what may be next. Using sound principles, my experience, your logic, and a little history, we can look at cultures and the world we live in and possibly gain insights into what is to come. Keeping this in mind - what if I told you major and measurable events and aspects of world – and American – democratic civilizations and cultures have been occurring on roughly an eighty-two-year cycle for centuries? What if the concentration of wealth or the business output and activity beat at a recurring rhythm that no one ever taught you in school? What if we see periods of repeating gilded ages and times of religiosity come and go with seemingly predictability? What if things like wars and incidents of death and casualty rates are not that random? Where do you imagine the next point will be? Where do you feel like we are heading? The three highlighted times and events in the bottom half of (figure 2) were not chosen at random. It was during the three bottom points that Americans experienced eras that saw over twenty-five percent reductions in business activity and double-digit inflation or unemployment. Sadly, these were also the only eras in U.S. history where conflicts resulted in one percent or more of the population being tallied among the dead, wounded, or missing in combat-related action. It is not by chance or accident that America has experienced great cataclysms or “crises” about every eighty-two years or so. Looking back before the shot heard ‘round the world and the founding fathers were signing the Declaration of Independence, another eighty-seven years had just passed since the Anglo-American “Glorious Revolution” of 1689 and Independence Day. Go back a slightly longer period, and you reach the English naval victory over the Spanish Armada—a turning point in England’s history. Another eighty years or so before that takes you to the end of the War of the Roses, a bloody civil war whose passage enabled “Tudor” England to emerge as a modern nation-state. Can we apply these same principles and logic to the progression (or predictions) of behavior in education trends, business cycles, political swings, religion, or even people, cultures, and societies? Of course we can! 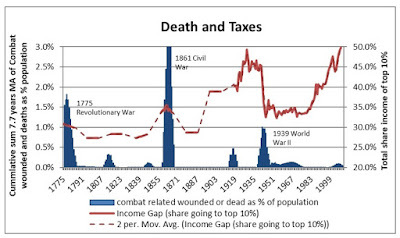 We see it back in (figure 3) with the income or wealth gap growing and the peak followed by a decline occurring approximately every eighty-two years. We saw the last spike just prior to the stock market crash of 1929. 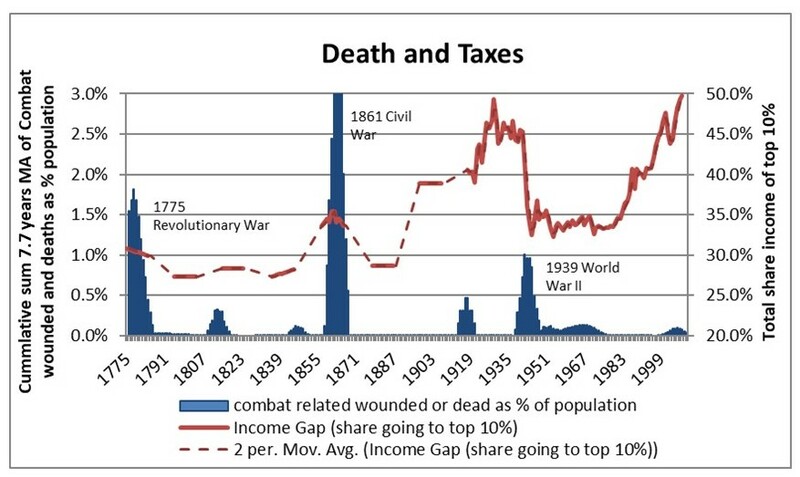 Just shy of eighty years prior to the panic of 1857, we had the peak of 35% of the income going to the top 10% of the population followed by a steep drop. Go just over eighty years earlier (and prior to the Revolution) and we see another pinnacle of the wealth gap during the credit crisis of 1772. Forecasting the future and events is not voodoo, but simply taking sound principles, reason, statistics, and modeling to generate a probable conclusion. So, what does this mean is next? In this book, we must start to peel away at this onion and look deeper into the data and patterns to find causal variables and what is driving these cycles and rhythms. We must use principles, logic, and intuition to better understand what has happened and what will happen next. Speaking Engagements - If you would like to inquire about having me at your event, please include date, location, and type of audience. Media Request - If you would like to book for an interview, or repost any content, or contact me about any other media/publishing, please email me here.